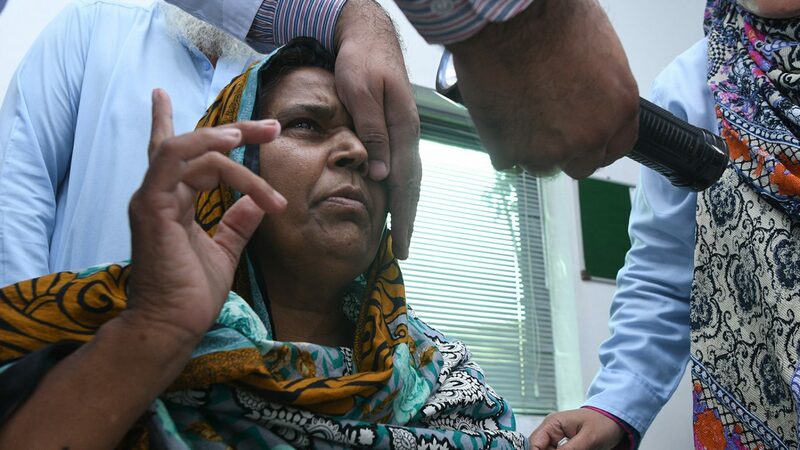 The first time we meet Naheed Akhtar is at the LRBT eye hospital in Mandra outside Islamabad, Pakistan. Naheed has bilateral cataracts, and today she’s having her final assessment before receiving surgery. 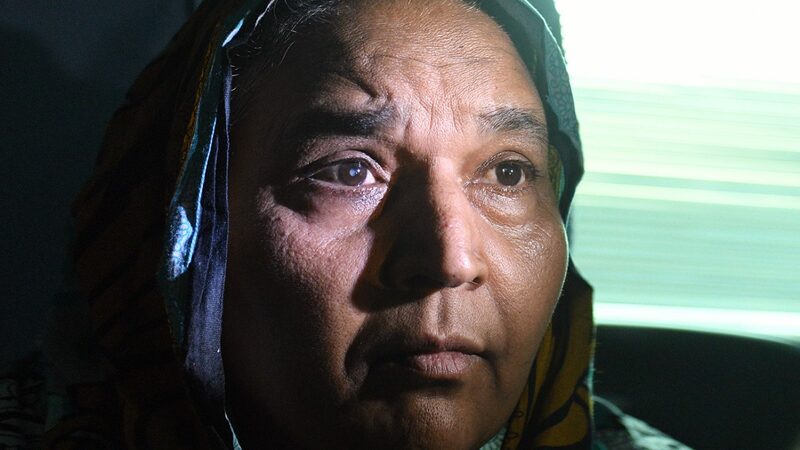 As well as having cataracts, Naheed, who’s 55, has diabetes, and is paralysed in the lower half of her body following a stroke about eight months ago. She now uses a wheelchair, which today is being pushed by her husband Mahmoud. Naheed speaks very little and seems detached and unhappy. 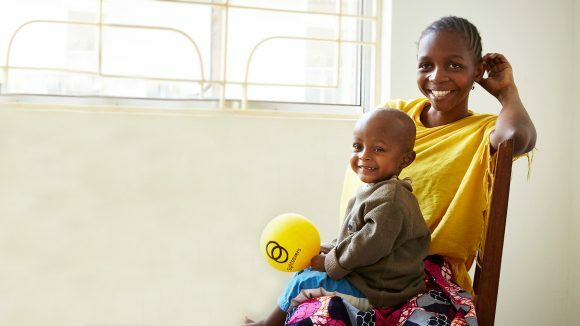 Naheed is one of the final cataract patients to receive surgery as a result of Sightsavers’ Million Miracles campaign, which has raised funds to support a million cataract operations in the countries where we work. She was reached through the new disability-inclusive Right to Health programme, funded by UK aid, that aims to make sure the most marginalised groups are able to access health care services. Even as we’re observing Naheed’s assessment, we notice some of the barriers that could make contact with the health care system difficult for people with disabilities. The rooms in the hospital are narrow, and the equipment is often out of reach for someone using a wheelchair. For one of the tests, Naheed has to be lifted up under her arms from behind by Mahmoud while a nurse presses her head against the instrument and holds it steady as the doctor shines a bright lamp in her eyes. It is a visibly painful and awkward position for her. Afterwards, we follow Naheed back to her brother-in-law’s home in Rawalpindi, where she lives with Mahmoud. The streets of the maze-like neighbourhood are narrow and phone wires create a magnificent mess over our heads. Women carry shopping, men hang around the little snack shops, children are playing and everyone is looking at us. Suddenly Mahmood is signalling to us to continue and he disappears down a different road with Naheed. The reason soon becomes clear: the road gets very steep and we struggle to keep our balance in the dust as we walk down. It’s obvious Mahmood wouldn’t be able to manoeuvre the wheelchair down, or up for that matter. It’s another significant barrier that Naheed faces – just outside her own front door. 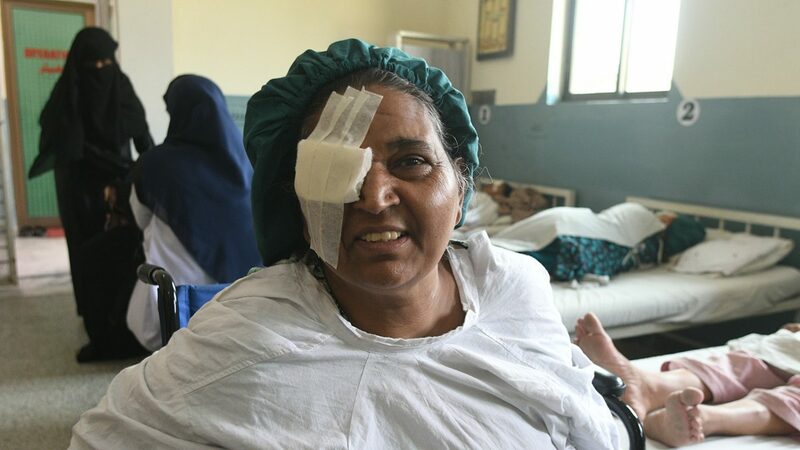 Naheed having her sight assessed before her operation. Upon arrival we’re are shown into a room which looks like a mix of living room and bedroom, with beds and chairs along the walls. 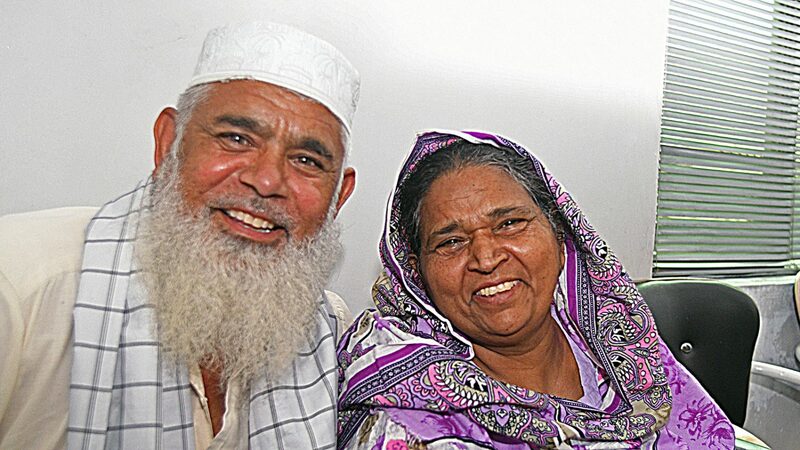 Mahmoud leads Naheed to the bed next to where we sit, and over cups of sweet chai tea we get to hear her story. Naheed’s vision started to deteriorate around four years ago, and has been lost completely for the past nine months. Before this she used to work doing people’s cleaning, cooking and washing. “I used to manage each and everything in my house,” she says. “But now I’m useless because of my illness. I was so active – now, I’m very lazy. I want to do the work but now I don’t have the power to do so.” Mahmoud was working as a taxi driver but now he spends most days taking care of his wife, and their sons are providing for them financially. Naheed just after her operation. 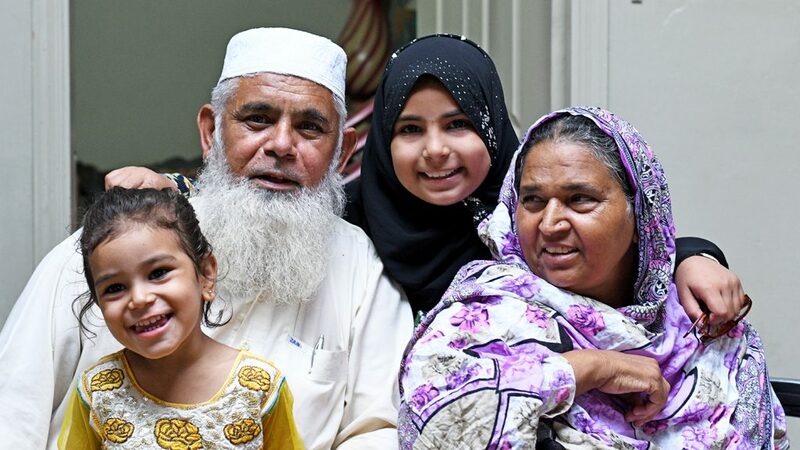 The day of Naheed’s cataract operation is sweltering hot, even though the violent thunderstorm that caused the windows to rattle in the night seems to have cleared the air slightly. In the women’s waiting room, which has big windows, noisy fans and rows of beds along the walls, there are women waiting for their cataract operations. It’s very quiet and tense. Naheed, who is accompanied by her daughter Busheer, has just had her blood pressure taken and her blood sugar levels checked. As she is diabetic this is very important , as the operation won’t go ahead if the levels are too high. Back at Naheed’s home, we arrive just in time for her bandage removal. A seemingly endless stream of family members and neighbours are filling the room. The visiting optometrist gently removes the bandage, wipes Naheed’s eye dry and applies eye drops. He holds up three fingers: if Naheed can see them, we’ll know that the operation has been successful. We are all watching anxiously and… she gives the correct answer! There’s a collective sigh of relief and the atmosphere in the room goes from nervous to joyous. While the rest of the family members are chatting excitedly, we ask Naheed what she is looking forward to seeing the most. The answer comes as no surprise: her children and grandchildren. Her youngest granddaughter, Savera, is brought over to Naheed, who can properly see her for the first time. Seeing Naheed holding Savera, looking closely at her face and kissing her, is an amazing experience. When we ask Mahmoud how he feels now that Naheed has her sight back, he doesn’t say anything and at first we think he didn’t hear the question. But then we see the tears in his eyes. He struggles to say something but his voice is too full of emotion. Seeing this strong and confident man cry with relief shows just how hard the past four years must have been for him. We meet Naheed at the hospital for her post-surgery check up, then join her at her son’s house to chat. It’s immediately obvious that something has changed. The quiet, withdrawn woman we first met is now happy and relaxed, smiling and laughing as she sits in her wheelchair with her grandchildren playing around her. She is clearly thriving in their company, and her love for them really shines through when she kisses baby Savera and talks to her granddaughter Noor, who is showing off her new pink dress. Getting her sight back seems to have motivated Naheed to improve her health in other ways: she is receiving treatment for her paralysis and she is hopeful that her condition might improve a little. Seeing Naheed’s outlook so totally transformed shows the profound impact a cataract surgery can have on a person’s life. Naheed has not only regained her sight, but also her self-esteem, and we feel a deep sense of gratitude to have been able to witness her journey. Dr Msukwa is an ophthalmologist in southern Malawi. 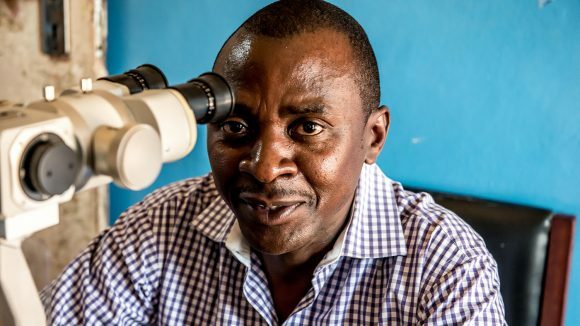 He restores sight through cataract operations, and says his passion is helping children to see again. Baraka loves a hug, but cataracts meant he couldn’t see the faces of his family. Thanks to donations from people like you, we were able to restore his sight.